Loopers continue to be popular for use on stage, but different musicians ask different things of them, and so they vary in complexity from ‘one-button wonders’ to fairly complex devices. 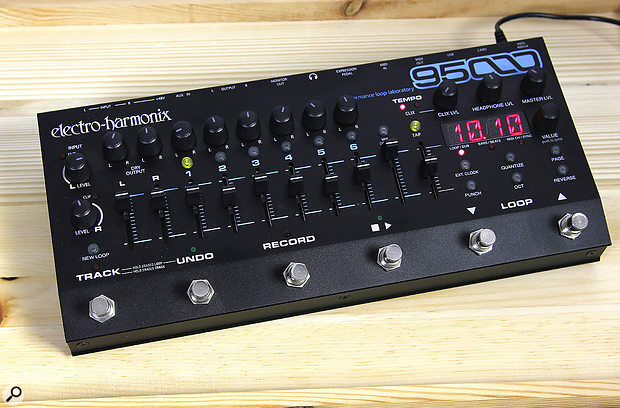 Well... the Electro-Harmonix 95000 Performance Loop Laboratory looks to be the daddy of them all! Essentially, the EHX 95000, as I’ll call it here, puts six separate tracks at your disposal for loop recording, and then adds a stereo mixdown track on top so that, using the onboard track faders and pan pots, you can mix and record a performance based on your recorded parts. The EHX 95000, then, is part looper, part multitrack recorder. It boasts a massive 375 minutes of sampling time that can split into up to 100 loops. And if you need more loop tracks you can link two units for 14-track operation. There’s even a punch-in mode, as well as a reverse-playback function, and the controls also allow the playback speed/pitch to be changed over a two-octave range. The recording medium is an included 16GB Micro SDHC card, though you can also use your own, up to a maximum capacity of 32GB. Power comes from an included 9V DC adaptor. Housed in a low-profile, robust aluminium chassis (320 x 150 x 65 mm), the control layout includes six footswitches for floor operation, plus 13 knobs, 10 sliders and 15 backlit buttons, all of which can be brought into play if using the device on a desktop. No external mixer or mic amp is needed for recording as two balanced/unbalanced mic/line/instrument inputs (Neutrik XLR/jack Combo sockets) are built in, and there’s switchable phantom power on the mic inputs. Left and right outputs, a monitor output, an aux stereo mini-jack input and a headphone jack are also located on the rear panel, along with MIDI In and Out DINs, plus an expression-pedal input jack that can be used to control the loop volume. The recessed SDHC card slot is also on the rear. If you like playing to drum loops you’re in luck, as EHX not only provide 20 drum loops, which come already stored on the memory card (accessed via the Master track) but they also offer a free download of more loops. You can also import your own audio in 16-bit/44.1kHz WAV format from either a Mac or Windows PC simply by copying them to the card. Click-track and tap-tempo facilities are also built in, with the four-digit LED display indicating bars and beats. This also shows certain setup parameters and edit parameters. And then there’s MIDI. MIDI Clock (master or slave modes) is supported for sync’ing external devices, such as drum machines and your DAW computer. In fact the MIDI implementation goes pretty deep, with the ability to address all the key controls via MIDI Control Change messages and Continuous Controllers. MIDI Program Change messages may also be used to select loops and to access the front-panel buttons. The input channels, presented on Neutrik Combo jacks, cater for phantom-powered mics, as well as line and instrument signals. You can either record one input onto a mono track on its own, or engage two tracks at once to record the two inputs individually in one pass. The two knobs on the left set the input levels and the two Dry Output faders set how much of the input is heard in the phones or monitor mix. If you’re working to a click, the click level can be set using the Clix Lvl knob above the display. Two more knobs in this area set the headphone level and the master level. A rotary encoder to the right of the display incorporates a push switch for adjusting the currently displayed parameter. Buttons below the display address Ext MIDI Clock, Quantize, Page, Punch, Oct and Reverse. Before I continue, I need to discuss a little terminology. The six sections of a loop are referred to as Tracks, since the term Loop is reserved for the content of all six tracks plus the stereo master mixdown track. Each of the six mono tracks has a short level fader, a pan pot and an illuminated track-select button. The two right-most sliders control the mixdown level and the tempo, and Tempo also doubles as a playback speed slider — which also changes the pitch, vari-speed style. The Tap LED above the slider lights solidly after a loop is recorded but turns off if the tempo is changed from the original. The six footswitches, the first four of which have status LEDs, are marked Track, Undo, Record, Play/Stop, Loop Down and Loop Up. Holding down Track erases the selected Track while holding down both Track and Undo erases the complete loop. Erasure can be undone using the Undo footswitch. This is a deeper product than most EHX pedals, and EHX clearly recognise that, as they’ve provided a proper manual which explains clearly the functions of the controls and the processes involved in recording, overdubbing and mixing. This manual runs to 40 pages and includes useful colour diagrams. The basic process for recording a track is to set the input level such that the clip LED doesn’t come on (adjust until the clip LED just comes on, then back off the control slightly). Then, when the Record footswitch is pressed, recording starts on Track 1. The display shows the bar and beat progress, and the click level can be set as required. Pressing Record again stops recording and immediately plays back the loop. Or, press Play to go back to the beginning and automatically start a new recording on loop 2. To record onto a different track, you can cycle through the tracks using the Track footswitch or press the Track Select button to access it directly. Note that the length of the first recorded track sets the track length for all subsequent tracks including the mixdown track. The click track, which can be set to any comfortable volume, or turned right down, feeds the monitor and phones output but not the main output. The two LEDs marked Tempo flash, one to show the click speed and the other lighting only on the first beat of the bar. It’s possible to overdub onto a selected track in the same way you might with a more traditional looper, by selecting a track with a recording already on it, then pressing Record. When overdubbing onto a track in this way, both the Play and Record LEDs illuminate. If it doesn’t work out you can use Undo to remove the last-added ‘layer’. If you want to record two tracks, for example as a stereo pair, you can hold down a pair of select buttons to arm them. If using Quantize mode, you get a four-beat count-in at the tempo you’ve set. Press Record or Play within half a bar after you want the recording to end and your loop will finish at the previous bar end. If you press Record or Play after halfway through a bar, the recording will continue until the end of that bar. If you want to make a mix from the six loops, pressing Mixdown gets things started and all your level and pan adjustments are recorded in real time as the mix takes place. Should you wish to, you can start your mix part way through the tracks rather than starting at the beginning. The Play/Stop switch stops recording. To play back what you have just recorded, you have to remember to turn up the Mixdown slider but also to turn down all the track sliders so you hear only the mix. Alternatively you can let your recordings loop and use the faders to create a live performance. Even the Master recording can be layered using the Dub function. Dub essentially uses feedback to preserve the original recording by re-recording it as you add the new part, and the feedback level is adjustable from 1 to 10. If Dub is set to zero, previous recordings are erased as you record a new pass. As with all loopers, you need to become familiar with the controls to avoid embarrassing moments if you plan on playing live, but EHX have done a fine job in not hiding too much away in menus, and the learning curve is less challenging than with some of the competition. The sound quality is suitably clean, and even the octave-shift effect sounds pretty smooth. In CX.On mode, the click track runs continuously (if the volume is turned up), enabling recording to start at the moment you press Record, though you can also set a count-in value from one to eight bars if you prefer, and have the click sounding only when you record. It should be noted that all the track loops, including the mixdown, are always of the same length, so if you want to record a long mix based on multiple loops of your recorded tracks, you’ll need to feed the output into an external recorder. As you might expect, I had a few ‘What’s happening now?’ moments, but it didn’t take long to become familiar with the essentials, and there’s plenty of depth for those who like to take things further, especially given the comprehensive MIDI implementation. There’s that useful option to drop the playback or overdub speed by an octave (using the Oct button), to change the speed of playback using the Tempo slider, or to reverse loops. It is also possible to adjust the playback speed slider to create some fun effects while maintaining the same overall tempo by engaging Fixed Tempo mode. This invites a little creative abuse as it introduces subtle (and sometimes not so subtle) pitch wobble effects. The aforementioned functions apply to all six tracks, not just the currently selected one. Not surprisingly, there are a few features that I’d like to see added — such as the ability to avoid being limited to the loop length when recording a mix, or being able to reverse only a single track — but on the whole the 95000 Performance Loop Laboratory exceeded my expectations as a looper. That it has enough recording capacity to use it as a basic multitrack recorder too is a great bonus. In short, then, this is a looper that’s easy to learn and has bags of creative potential. If you want to go beyond basic overdubbing, you really should try out the EHX 95000 Performance Loop Laboratory. When it comes to looper pedals, the most serious competition comes from Boss and TC Electronic, but I’ve seen nothing that I’d consider to be a direct equivalent to the EHX 95000. For those with more modest multitrack looping needs, EHX also offer the less expensive 45000 model. The most comprehensive looper yet? While designed for foot operation, the unit really needs to be on a desk for you to be able to operate many of the controls. Occupies a lot of space on a pedalboard. This sophisticated looper blurs the lines between looper and multitrack recorder without compromising on ease of use.